A bit of a mystery this time. My wife gardens in our backyard, and we regularly turn up marbles, small toys, bottle caps, bits of glass, dinner plate fragments, and similar things whenever she turns over the soil. One of the most intriguing objects is the below medallion. I suspect it’s a flattened penny, embossed(?) by a penny flattening machine. I have yet to turn up anything about a Mickey’s Lounge at 4080 Milwaukee Ave. (currently occupied by a parking lot and physical therapy clinic; though, intriguingly, up the street from the Portage Theater). 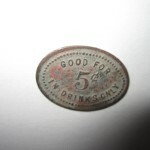 The low drink price tells me this medallion goes way back, but while I’ve turned up several Mickey’s Lounges in the Chicago Tribune’s archives (all of which apparently ran afoul of the law through gambling or showing naughty films), none were located on Milwaukee Ave. So, what gives? 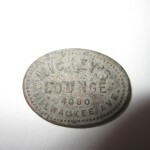 Any suggestions or clues about what this is, exactly, and the history of this particular Mickey’s Lounge? Let me know at dan@mrdankelly.com. Later Note: Not surprised to see that bar tokens were a fairly common item.